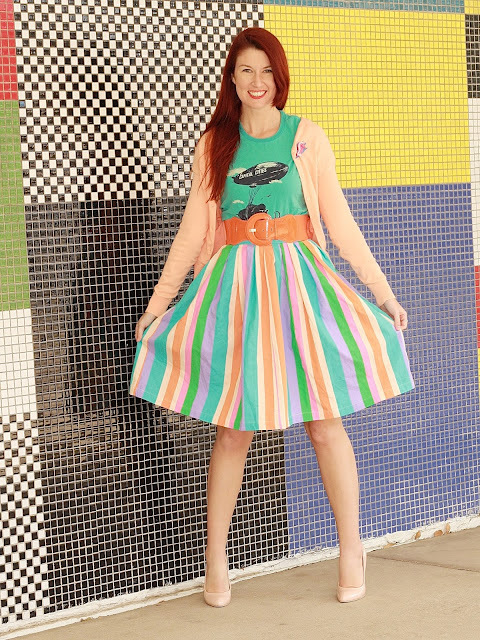 Style details: The cardigan is J Crew Factory, the brooch is Erstwilder via DNJ Retro, the shirt is a band tee from seeing Capital Cities (more on them in a moment), the belt is from Viva Ducle Marina, the skirt is ModCloth, and the shoes are Steve Madden via DSW. Motivational: Hug your pets! This post was supposed to go out yesterday but between final editing and actually publishing, I took my beagle to the vet and she somewhat unexpectedly got diagnosed with a cancerous tumor. She's getting surgery next week to remove it and since she's acting like a totally healthy dog, we're hopeful the cancer hasn't spread ::knock on wood:: I'm always affectionate with my dogs but even still it doesn't fee like enough not knowing exactly what she'll be going through over the next few weeks. Life can or at least will threaten to change within a day, so make your loved ones (K9, feline, humans, all) know you love them and cherish time with them! Music: Because I'm wearing a Capital Cities shirt, I HAD to pick their most famous hit, "Safe and Sound" as my blog post title. Maybe a few of you are scratching your heads wondering who Capital Cities are. If you click the video below you WILL recognize the song for sure as it's been all over the place for 3 years now. I saw Capital Cities at the end of 2012 at a really tiny venue here in Denver. I felt like going was a wise move because I "knew" they were going to blow up and I wanted to be able to brag that I saw them when they were still playing tiny clubs. I saw them again in mid 2013 at a sold out show at a larger (but not huge) venue, so it seemed like they were on track. I don't listen to the radio a ton, but it feels like their other single besides "Safe and Sound" have only done so-so. So maybe I was wrong about them blowing up, or at least it hasn't happened yet. I love that skirt. The colors on it remind me of my childhood! I hope your dog will be alright!!!! Keeping my fingers crossed all goes well! Yesss, so glad you got the rainbow skirt!! Isn't it awesome? I have that same orange belt too, ha. Really hope the cancer hasn't spread in your doggy! Good luck with the procedure. I hope your puppy is ok!! You look gorgeous - that skirt is SO fun! You're always so pretty and chic, love this look! Love this colorful look! Very beautiful! So *that's* who does this song! I'm usually about half a decade behind the times. This outfit is amazing -- you look terrific in these saturated pastels! This skirt is definitely a must-have. I'm thinking of you and your pup, and sending all the <3 your way! Oh no! I'm so sorry to hear about your pup! Sending good thoughts your way! And you are so good at putting together the prettiest, colorful outfits! I just love this look. And I don't blame you for not waiting until this skirt was on sale. Haha. It's so pretty! This skirt is unreal! I love the bright colours in it! Lauren, what a pretty outfit! I can't wait for snow to melt down to wear skirts and high heels more often:) I am the same when it comes to shopping - always waiting for the sale to justify my purchase, lol. Have an amazing Sunday, beautiful! Love all those colours in that skirt and the orange belt matches so well with the skirt! :) So sorry to hear about your little dog as well...hope all goes well! Such a gorgeous, colorful look!! You're gorgeous! If I saw you in real life Lauren I would totally run up and hug you! This is a dream outfit and the styling is stunning (Of course I wouldn't expect anything less from you ;)) This look just makes me jump for joy! LOVE LOVE LOVE!!!! I hope your dog is ok! Praying and sending well wishes his way for good luck during the surgery and a speedy recovery. 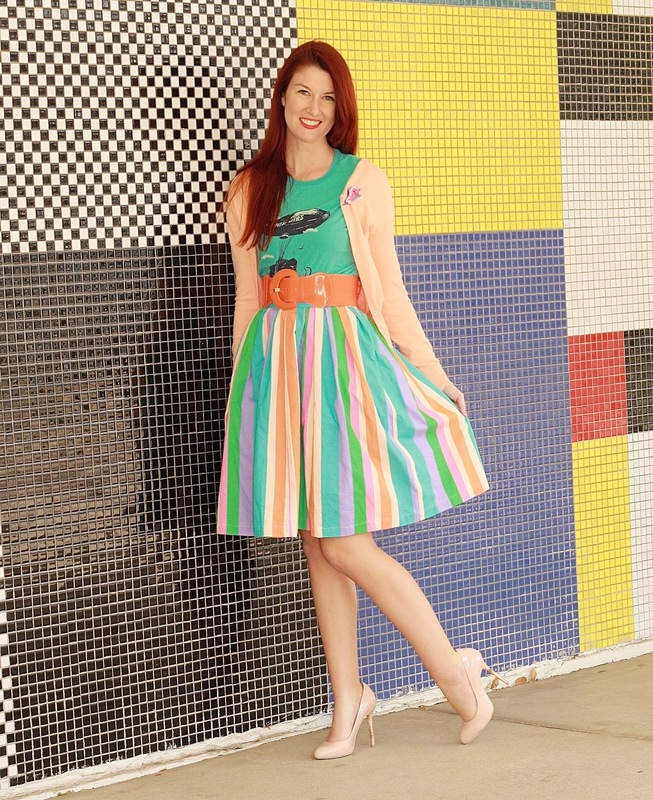 You look so springy fresh in this rainbow skirt! Ive been loving rainbow pieces lately and seeing you in this totally made me so happy.